It’s fun to come up with new uses for gingerbread, other than the standard cut-out cookies and, well, gingerbread itself. Over the years, I have turned it into cupcakes, macarons, doughnuts, pocket pies……even creme brulee. 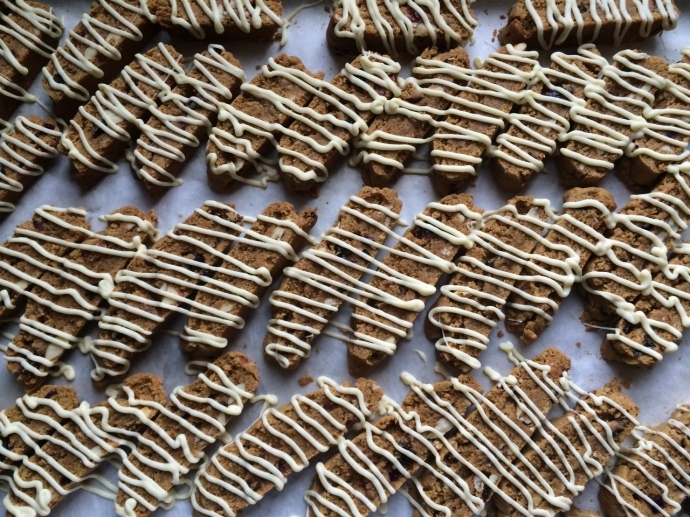 So, in the spirit of holiday cookie-swap season, it seemed only natural to bake ginger, cinnamon, nutmeg and cloves into afternoon coffee’s favorite sidekick: biscotti. But wait! There’s more. I’m not very good at leaving well enough alone when it comes to my baked creations, and I felt like these cookies needed a little somethin’ somethin’ to gussy them up for Christmas. That’s where the white chocolate drizzle comes in. 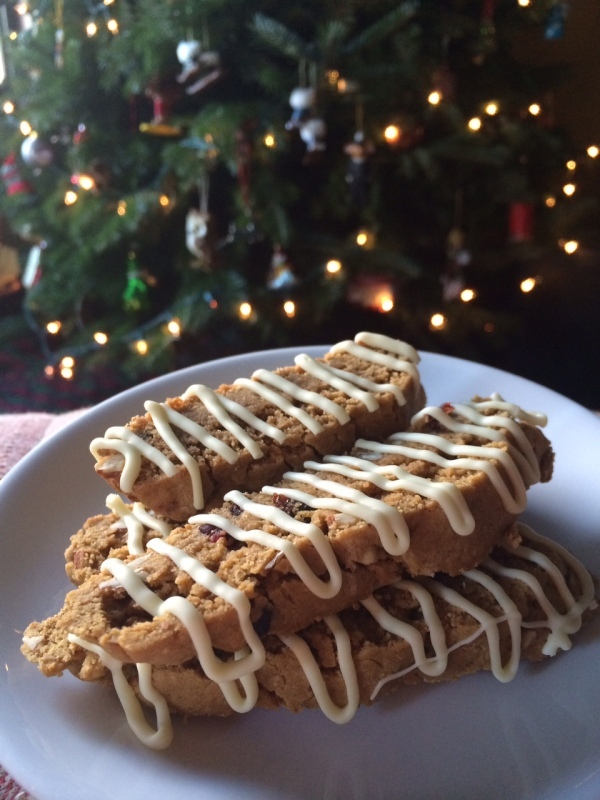 White chocolate, in all of its rich and buttery goodness, is an excellent match to the strong flavors of gingerbread. 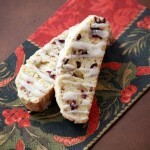 Plus, the snow-white zigzags make a beautiful contrast to the golden brown biscotti. I just love a pretty cookie, don’t you? Confession: I actually first made these cookies for our Thanksgiving dessert table, with plans to post the recipe a few days before the holiday. Here’s the thing about having a new baby–it takes about ten times as long for you to get something done as it did before your little bundle arrived. Now, I had heard this little rumor for years from other moms. You know what? Turns out that IT”S TRUE. 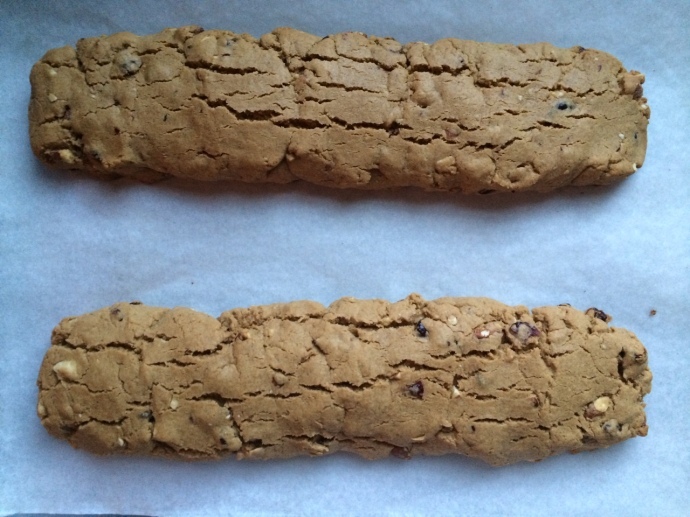 So, the original batch of biscotti gradually disappeared (even in my new time-compromised state, I managed to have plenty of time to eat them…..go figure. ), and a new one was baked a few days ago. This time, however, I added a mixture of dried cranberries and raisins along with a hint of orange zest…….because we all know that everything is better with a hint of orange zest. 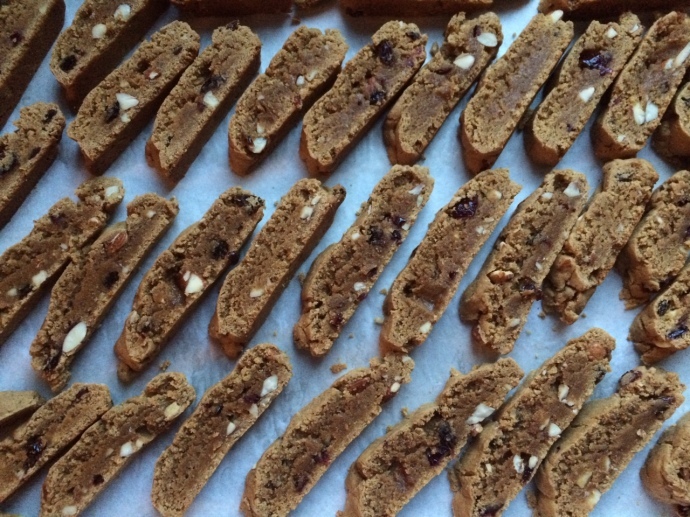 The process of making the biscotti from start to finish took me the better part of a day, simply because I was running back and forth, upstairs and downstairs, changing diapers, feeding, and attending to Gigi’s every need. On the plus side, I burned enough calories in the process so that I could taste test my creations, multiple times. These holiday cookies take the festive flavors of gingerbread and blend them with smooth and rich white chocolate for a combination that is sure to be a hit at any cookie swap. 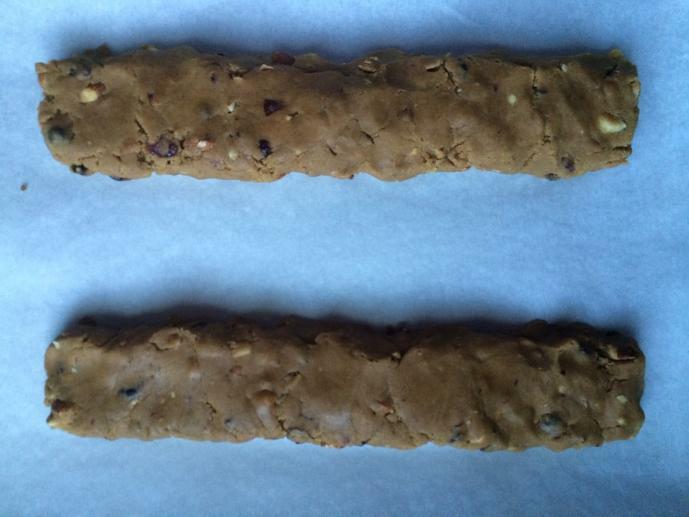 Crisp biscotti are perfect for shipping, too, making them a great option for a homemade gift! Preheat oven to 350F degrees. In a large bowl, whisk together flour, baking powder, salt, ginger, cinnamon, nutmeg and cloves. In the bowl of an electric mixer fitted with the paddle attachment, beat butter, brown sugar and sugar on medium speed for 2 minutes. Add the eggs, one at a time, beating well after each addition. Beat in the molasses and the orange zest. Add the flour mixture to the wet ingredients at low speed until combined, and then mix in the almonds and dried fruit, if using. On a lightly floured work surface, divide the dough into two equal pieces and form each piece into a log that is 12 inches (30 cm) long and about 2 inches (5 cm) wide. Place logs about 3 inches apart on a cookie sheet lined with parchment paper. Bake logs for 20-25 minutes, until they are lightly browned, firm to the touch, and the tops are starting to crack. Remove the sheet from the oven and let cool 10 minutes. Reduce the oven temperature to 325F degrees. Transfer the logs to a work surface and carefully cut them into 1/2-inch (1.25 cm) diagonal slices using a serrated knife or a very sharp chef's knife. Place the pieces, flat sides down, on cookie sheets lined with parchment paper. Bake the pieces 10 minutes, and then carefully turn them over and bake for 6-8 minutes more, until the biscotti are dry and golden brown. 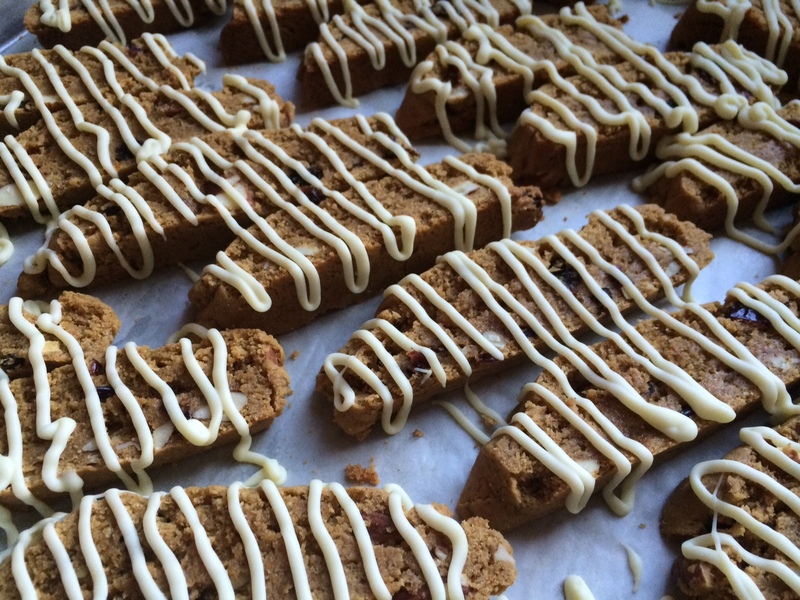 Cool the biscotti on the trays for 10 minutes, and then transfer to wire racks to cool completely. Heat the white chocolate in the microwave for 45 seconds and stir. 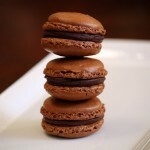 Continue to microwave in 15 second intervals, stirring after each interval, until the chocolate is smooth. 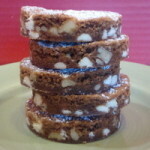 Using the tines of a fork or a piping bag, decoratively drizzle the biscotti with melted chocolate. Let the chocolate set for 30 minutes before serving. I’ve been checking in every now and then hoping to see an update on your baby! Is Gigi her name, or is it short for something… in any case, I *love* it! I’m sure she’s a bundle of joy and just adorable. 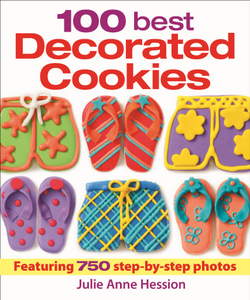 Oh, and yes, these sure are pretty cookies! Thanks so much, Karen! Great to hear from you. And yes, Gigi is short for Genevieve….middle name is June. I will remember to post a photo the next time I post — thanks for reminding me! Happy Holidays!! Genevieve June… it’s a beautiful name! I had a great aunt whose name was Genevieve. Seems like names from the early 1900s are making a comeback! Can’t wait to see her pic! 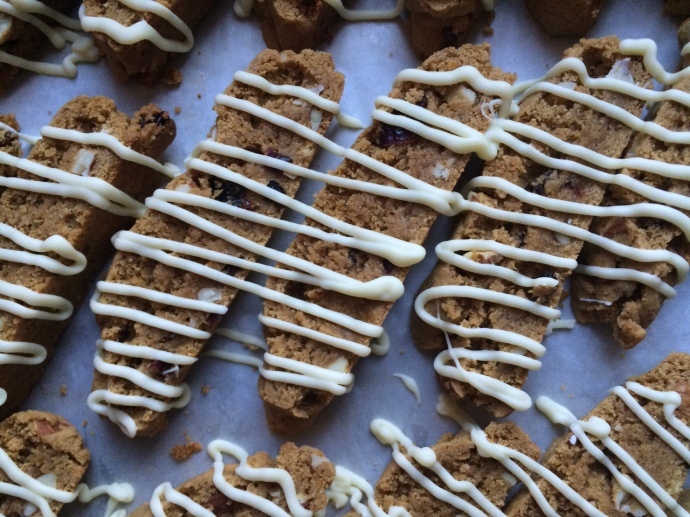 These biscotti are so pretty. 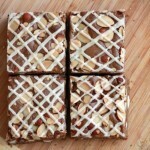 Perfect with a cup of coffee or tea! Hope that little bundle of joy is doing well! 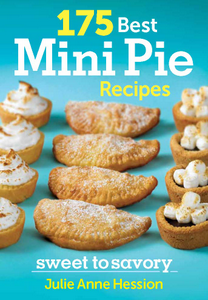 These look AMAZING and I can almost smell the gingerbread from here! 😉 Cannot wait to try these!